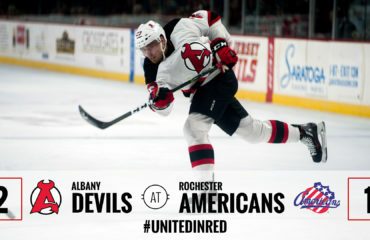 ALBANY, NY — The Albany Devils pushed their winning streak to three games, defeating the Rochester Americans, 4-2, Saturday. 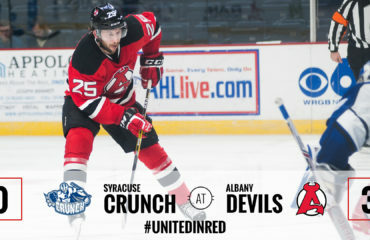 The Devils turned back the clock for the night, wearing special Albany River Rats jerseys to the delight of the Times Union Center crowd. Those fans had a lot to cheer about as the Devils/Rats scored four straight goals during the first two periods. John Quenneville led all scorers with a season-high three points (1g-2a). Miles Wood netted his second goal in two games and moved his point streak to three. 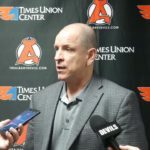 Joe Blandisi netted his fifth goal of the season, giving him nine points (4g-5a) in the last eight outings, and Blake Coleman posted his fourth tally. 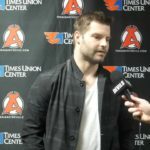 Ken Appleby earned his third consecutive win, recording 28 saves on 30 shots. His shutout bid was halted with less than three minutes remaining in regulation. 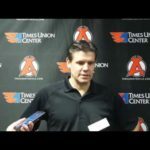 Albany continued its dominance on home ice, improving to 8-1-0-0 at Times Union Center and 12-6-0-0 overall. The Americans move to 7-11-0-0. Miles Wood opened the scoring at 17:16 of the first period, scoring off a rebound from a Petr Straka shot. With the secondary assist, Brian Gibbons registered the first of his two points. 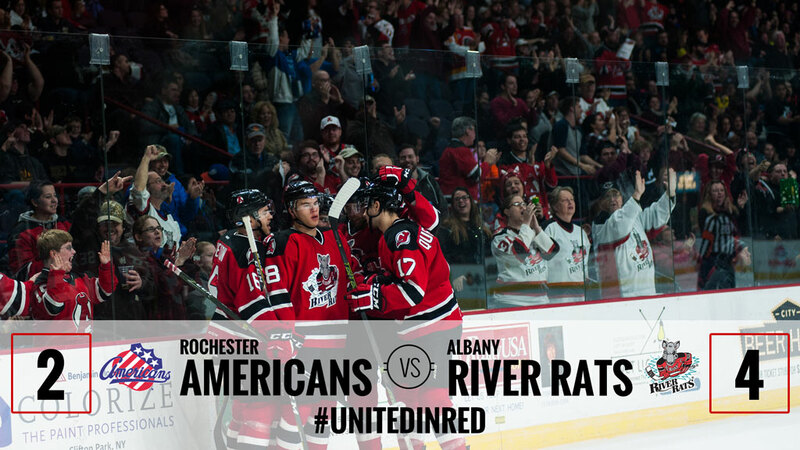 Albany added to their lead before the intermission when Quenneville and Ben Sexton setup Blandisi’s power-play goal at 19:50. Quenneville’s second point came in the middle frame when he had the secondary assist on Coleman’s tally at 14:27. 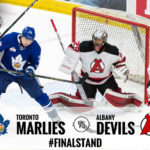 The Devils’ rookie moved the puck to Vojtech Mozik, who sent a slap-pass towards Coleman, who was able to win a position battle in front as the puck deflected off of his skate and into the net. 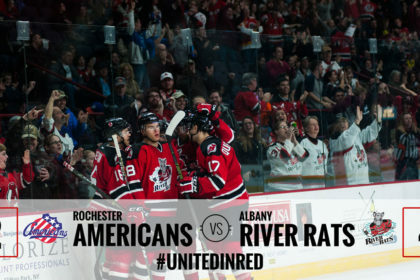 Albany concluded their scoring on Gibbon’s backhanded pass through the neutral zone to spring Quenneville for a breakaway. He went bar-down at 18:52 of the second period and also featured an assist from Seth Helgeson. Evan Rodrigues and Mike Aviani provided the back to back scoring for the Americans late in the third period at 17:26 and 18:49, respectively. 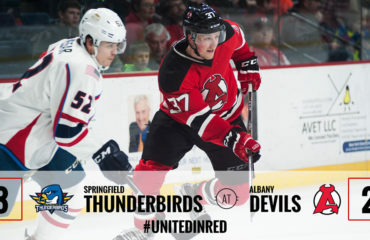 Next up, the Devils travel to face the Bridgeport Sound Tigers Tuesday at Webster Bank Arena. 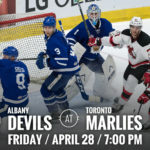 Puck drops at 7 pm.